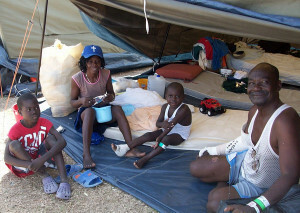 Billy Ponko, Director of Field Operations in Haiti, is currently on the ground there. Read his reflections on this initial planning venture. This is part two of his reporting (see part one here). April 8 – Day 4 – Part 1 "It’s all about the gutters!" Last night I awoke to the girl across the hall locked out of her room. She was convinced that no matter how many times she tried the combination, it would eventually open. Awake, I lay listening to the sound of rain. Then the sound changed; it went from an intense downpour, to close, rushing water. I looked through our open door to see a puddle surging down the hall. Water was pouring in by the inch through the second floor porch. We used towels to try to dam the corridors and let water flow down the stairs. The cause was clogged drains on the roof and at the balcony. It was such a sight: 12 people up in the middle of the night using brooms, mops, towels, bins, plastic lids, and metal chairs pushing inches of water down the stairs and as a chain gain out the front door. Amazingly, after a few more hours of picking up the water, the whole place dried out by morning. The rain had stopped just at the peak of the over flow into the building. Had it continued we would still be pushing water. In the midst of all the madness, I think Frank and I decided on the "must have" drip edge above the window and doors for the Fuller Center Haiti house design. Besides falling water, the day was good. We toured two tent camps with the organization ARC, who is looking to take one camp over to manage and ensure all its needs–health, water, food, etc–are met. Most buildings in Leogane and Port-au-Prince are in rubble. Some fell out, some fell in, and some just flattened (World Trade Center style). Most homes or businesses have moved into the streets, public squares, parks, or any nook they can clear out for themselves. Material is used for protection. Some are using corrugated metal lean-tos for shelter, others have created stick homes with metal panels. Tents are typical commercial camping types: military, emergency shelter brands, etc. There is such a mood of resilience and continuing everyday life. As we walk from the compound where we are staying, children shout “hey you,” smile, laugh and giggle. You can really get a rise out of them by waving back and repeating “hey you.” They come scrambling out of their tents or off their mothers’ laps with hands reaching for yours. They like to hold hands and walk a bit till you turn them back around and send them back to their mothers. Yesterday the screams and giggles were almost alarming as we turned to see one of the ARC guys, whom towers tall at 6’ 6” , in the middle of a jump rope game, the ground shaking with each leap. This brought all the nearby people out to laugh and giggle and smile, putting an end to our interviews. Until on his fifth jump he was entangled and the game was over. There are many complex issues at hand. Building homes for all the people contained within just a single tent camp would need to be big enough for 1,000-1,500 people. The camps are a blend of people who were in poverty before the quake, renters of rooms or apartments, and owners of the "high end luxury" homes that bordered the north property line. With the purchase of a Haitian phone to help with all the connections we are making here, we can now officially say the Fuller Center mobile office in Haiti is up and running! Stay tuned to this blog for more progress updates from Billy. And visit the Haiti page for more details on the Fuller Center project there. Consider helping sponsor a modest $3,000 home in Haiti. Click here to donate.